A few bumps and bruises are part of growing up, but sometimes a simple Band-Aid isn’t enough to fix every owie. From over-the-counter remedies with botanical extracts you can try, to how to tell when it’s time to visit the doctor, here’s your guide to coping with some of the most common childhood injuries. What It Is: Blood and fluid from damaged blood vessels, characterized by discoloured skin (red, black and blue). Seek Medical Attention If: Your child has received a severe blow to the abdomen, neck, back, chest or groin, or if the pain doesn’t ease after half an hour. Remedy: Try a witch hazel/water compress (soak a towel with a solution of 30 drops of witch hazel per cup of water and apply to the area). What It Is: A clean-edged or jagged separation of the skin. 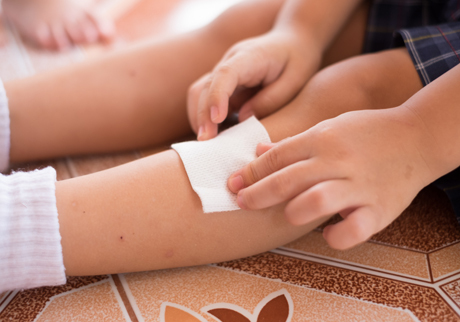 Seek Medical Attention If: You can’t stop the bleeding, or the wound is so deep that you can see fat or tendons (they look like fine white string), or the edges gape apart — your child may need stitches. Small cuts on prominent parts of the face (particularly the border of the lip) may need special care to minimize scarring. Since they’re particularly prone to infection, puncture wounds (especially bites, both animal and human) should be examined by a doctor. You’ll also need to visit the clinic if your child develops a fever or other signs of infection (increased tenderness, redness, fluid seepage or heat at the injury site). First Step: If bleeding is profuse, cover the wound with a gauze pad or clean cloth and apply direct pressure. Once the flow has slowed down, apply a thin layer of topical antibiotic, such as Polysporin, to help prevent infection, and seal the edges with butterfly bandages or strips. If the cut is minor, letting it bleed for a minute or two will help carry contaminants out of the wound. Next Step: Wash the wound and the area around it to prevent infection, you can use an anti-septic wash like BAND-AID® Brand HURT-FREE® Antiseptic Wash. Change any dressing, which should allow air flow, and check the wound once a day. For severe cuts, tub soaks are out for at least three days. Speak to your Shoppers Drug Mart Pharmacist for tips, products recommendations and more information. Remedy: Tea tree oil (for minor abrasions only) may help prevent infection. What It Is: A raw skin abrasion caused by friction. Get Medical Attention If: The wound covers a large surface, or is embedded with gravel or dirt that can’t be easily removed, or if your child develops a fever or other signs of infection (increased tenderness, redness, fluid seepage or heat at the injury site). First Step: Clean the area with warm water and soap; use running water or a spray bottle with clean water to gently remove dirt. Next Step: Your local Shoppers Drug Mart will have a great selection of topical antibiotics, such as Polysporin. Apply a thin layer to help prevent infection and help speed healing. If the scrape is severe or in a spot that’s tough to keep clean, cover with gauze. Change any dressing and check the wound each day. Remedy: Wash the wound with water containing calendula or hypericum tincture (about ten drops per cup of water) to promote healing. Botanical calendula cream will keep the area moist and foster growth of new skin.